With S-sama’s family in “Juraku-den” at Saami where they held a wedding reception. We have started warm spring weather finally as the calendar changed from March to April. I made a business trip to Kyoto to support my clients wedding the other day. There were many tourists from all around Japan and also from overseas. 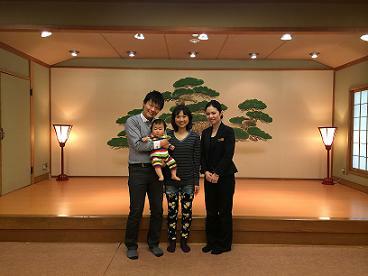 On March 30th, I met my client couple, S-sama and A-sama with their son Y-kun at Saami ryoutei restaurant. They celebrated their wedding anniversary there. They visited Nijo Castle after lunch and sent me a photo taken in front of “Koun-tei” where they had their wedding ceremony. It was a lovely, heart-warming picture which made me feel nostalgic. I really appreciate such a precious opportunity; seeing my client couple again after two years from the wedding day. Thanks for the wonderful moment. I’m looking forward to seeing you again in Kyoto some day.